Knuckleballers are a funny sort. The knuckleball produces unpredictable movement through a lack of rotation and speed on the ball. When thrown this way, the air kind of takes over and moves it around as it pleases. Watch Wakefield throw his knuckleball in slo-mo and you won’t see very many rotations. With a curveball, the ball will tumble end-over-end like crazy. With Varitek now No. 2 on the depth chart to Victor Martinez… things have apparently not changed. A few years ago, Wakefield had veteran Doug Mirabelli as his personal catcher, since Varitek can’t really catch the knuckler. In 2006, the Red Sox traded Mirabelli to the San Diego Padres and traded for Josh Bard from the Cleveland Indians, in the same deal that also netted them outfielder Coco Crisp. The results weren’t pretty. In five Wakefield starts, Bard had a league-leading 10 passed balls. A month into the regular season, Boston traded submarine reliever Cla Meredith to the Padres to get Mirabelli back. Many knuckleballers also have their own glove, similar to the PRO SPARKS model shown above. I remember seeing a story on MLB.com in 2003, when the A’s acquired Steve Sparks from the Detroit Tigers, about how Sparks traveled with his own glove, something bigger than a catcher’s softball mitt. Upon seeing the monstrosity, then-starting catcher Ramon Hernandez called backup Adam Melhuse over to take care of it. So I was pleasantly surprised to see an article in the New York Times this week about R.A. Dickey, who has been pretty hot since the Mets called him up to replace erratic lefty Oliver Perez in the rotation. 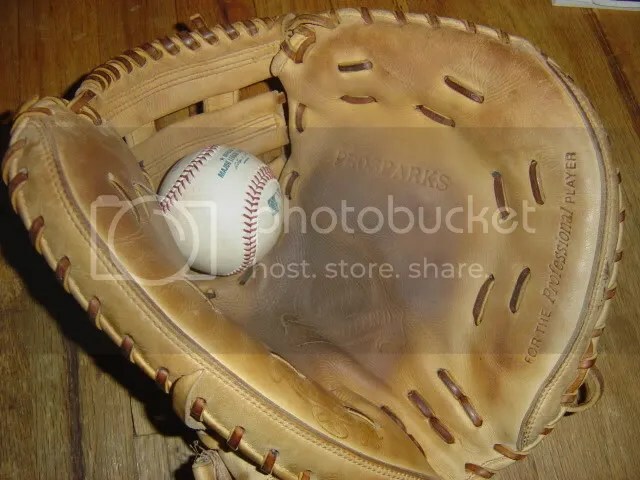 Or rather, the oversized mitt of R.A. Dickey, which has taken a pounding since its inception in Minnesota. I’ve always found the oversized glove fascinating. When I was interviewing Chico Outlaws catcher Robbie Alcombrack, who has become the designated catcher for female 18-year-old knuckleballer Eri Yoshida, he said he doesn’t use anything other than his regular mitt. He did have a couple of passed balls the night I went, though. He said it was rough catching it in spring training, but he’s gotten better at it as the season has gone on. Traditionally, because the glove is used only for a knuckleball pitcher, it is his responsibility to provide, maintain and distribute the glove to his catchers. Dickey has had the old, black Rawlings glove with his name stitched on it since spring training 2009, when he was with the Minnesota Twins. “I feel a little dorky, like a field-goal kicker carrying around a tee,” Dickey said. So after that game in Baltimore, the call went out from the Mets’ equipment manager, Charlie Samuels, to the Rawlings representative Stevie Cohen. Sensing the urgency, Cohen immediately secured a new Pro Sparks Model, named for the former knuckleball pitcher Steve Sparks, who helped design it for Rawlings. Because there are so few knuckleball pitchers, Rawlings had only one on hand. It was sitting in a closet in the company’s headquarters in St. Louis, and Cohen had it shipped overnight to Cleveland, the Mets’ next destination.